Ever feel like the roadmaps you make in Excel or Powerpoint are out-of-date the moment you finalize them? Are colleagues always stopping by for status updates? Do they understand what's coming next, let alone where you'll be in six months? As product managers, we've long envisioned a dynamically updating roadmap that we can use to communicate the plan and rally everyone around where the product is headed and why. The Roadmap board is an interactive visualization of your plans that you can share with colleagues across the organization. You can create multiple views of your Roadmap to cater to different stakeholders and all will automatically remain up-to-date. Grouping by release is helpful for communicating when features may be available. The way you name releases is up to you, and can be adapted to fit your team's conventions. Grouping by status is helpful for seeing what phase a feature is in today: New idea? Under consideration? Candidate? In discovery? In delivery? Ready for launch? Status values are customizable and can be updated by an admin in project settings. Whether you group features by release or status, you can add additional swimlanes to display your features by Objective or by Hierarchy. For a simpler Roadmap you can leave features arranged as a Flat list. When you're using your Roadmap for planning purposes, it can be helpful to display additional values on Roadmap cards, like effort, owner, and priority. You can also decide whether to show hidden cards or underlying subfeatures. 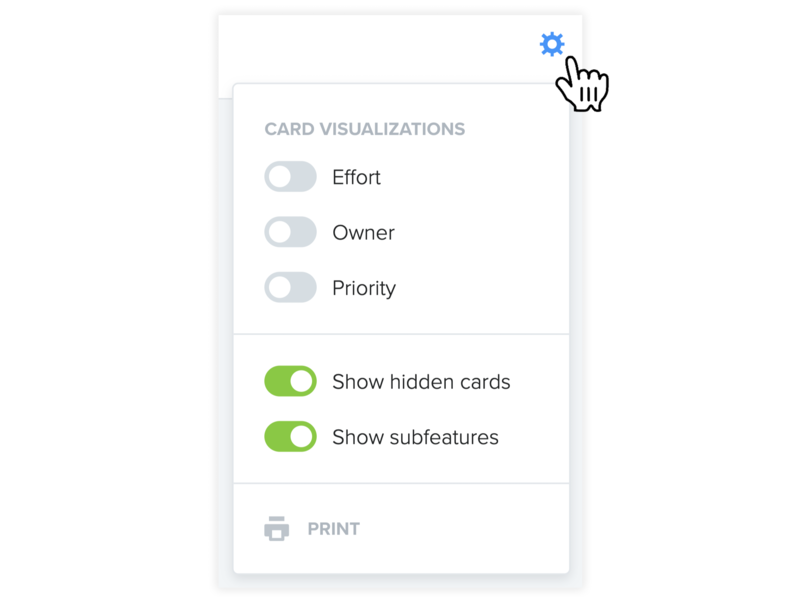 Hidden cards are those that have been manually hidden (by selecting the eye icon beside a product, component, feature, or subfeature.) When a card has been hidden, it won't be visible to any contributor viewing the Roadmap but it will still be visible to other makers. It will also be visible to you unless you choose to hide it with this setting (e.g. if you're doing a live Roadmap presentation via screenshare). 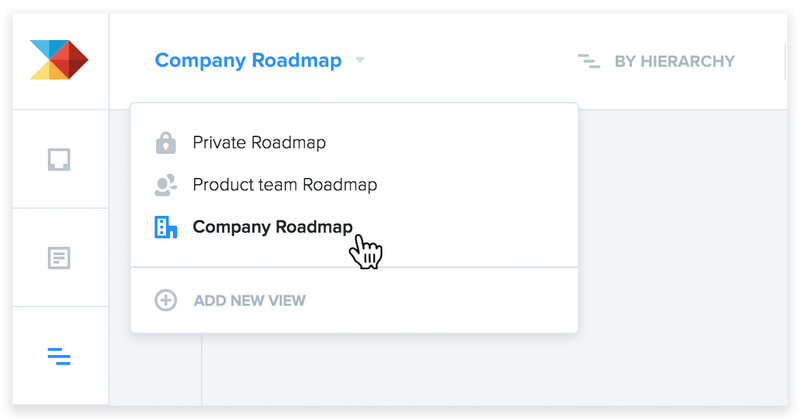 Create a saved view of your Roadmap to capture the current configurations, so you'll be able to return to them at any time. If you've already configured your view how you'd like, click save to overwrite the existing view, or save as to create a new view capturing the current configurations. If you'd like to create a new view from scratch, select add new view. You can opt to share a saved view with other makers, or contributors as well. When you invite colleagues from across your organization into productboard as contributors, they'll see whichever views have been shared company-wide. They won't see any views that are private or that have only been shared with makers. Any changes you make to your roadmap are made to the current view your on. They'll only be visible to others once you've saved the current view to update it. Otherwise any changes will remain local to you, and all others will see the last updated version of the view. Export your Roadmap to PDF using the print icon. You can also zoom to the desired resolution in your browser and take a high-resolution screenshot to add directly to an email, Slack channel, or presentation. If you're a project admin, invite a colleague into your project as a viewer to see what they'll be able to see and do on your roadmap. We've covered our auto-generated Roadmap, best for sharing plans with internal stakeholders. Now let's move on to the Portal, where you can get feedback on ideas and share high-level plans with colleagues as well as customers.